It should have been obvious from my piece back in May on Gaziano & Girling’s new Deco line that I would be very tempted by them, and this is the result a few months later. 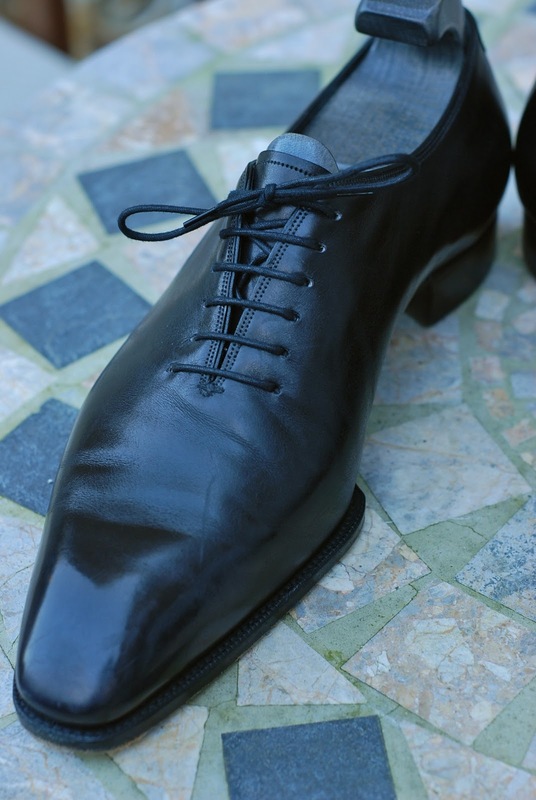 They are gorgeous shoes, whole-cut Oxfords in a luscious black calf. Apart from a light bit of bleaching on the toe, the styling is kept to the last and waist treatment. But what style. A narrow rounded waist spreads flauntingly into a square sole, creating the so-called spade effect. The toe box is long, though the shoe is also deceptively wide across the vamp. That is probably where I went slightly wrong with the sizing. I was concerned that the last would be too narrow, and so went for a 9 rather than my normal 8 1/2. As a result the shoes are a little too big. You can see that in the wearing (about a dozen wears so far) they are creasing in a few different lines on the vamp. That’s always a risk with whole-cuts, of course, but it is exacerbated in this case. The style itself will not be to everyone’s taste. For me, they are a wonderfully sharp alternative to more classic, subtle business shoes like the Cleverleys I wrote about last week. Perhaps with silk laces for black tie, rather than meetings. Then again, even those Cleverleys are sharper than the more square-toed Cleverleys I got in the sale two years ago. Incidentally, in the picture above you can get a better sense of the ‘gap’ around the waist that gives shoes such as these such delicacy – as I referred to in that Cleverley piece last week. That’s the most exciting aesthetic thing about bespoke shoes, for me. For more details on Deco, see feature here. You can follow the discussion on Gaziano & Girling: Deco – the shoes by entering your email address in the box below. You will then receive an email every time a new comment is added. These will also contain a link to a page where you can stop the alerts, and remove all of your related data from the site. Could you explain what makes the Deco range special? I want to know what’s the difference between the same model that you have and the Grant , the whole cut shoes from their standard range. I have got two pairs of GGs and I like them a lot but found them a but MUCH at times, “Look at my shoes” type. Are Deco range takes this to another level or tone it down? Nice article. I am curious about the fit. If the shoes are truly bespoke, how can they be too large. Were you not measured? I had a similar issue on sizing with a pair of John Lobb Garnier II. They are not a full one cut as such but the front section of the shoe is like a one-cut. I asked John Lobb to replace the in-sole by a slightly thicker one. The cost is minimal (EUR 15) and this is not visible at all. This is about a quarter of a size. The fit is now excellent. Yes, in fact I had a chat to Tony and Dean just today about the best solutions. We are going to shrink the shoe slightly with a solution left on the leather, and then perhaps look at an insole as well.